100% brand new and high Quality Waterproof Nylon material,can be used in the rain. 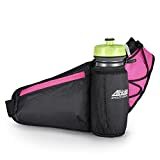 Really big enough and perfect for carrying your water bottle, large cell phone with a case, keys, cards and so on when you are cycling, running hiking climbing or anyother outdoor sports. Nice & tight, fits great for waist sizes between 23-55 inches with expandable strap, which won’t loose even if you are running, with an additional elastic band extender to fit all waist, and our running belt can turn this waist bag into a crossbody/shoulder bag when the extender added.Expandable bottle holder can secure a water bottle whose diameter up to 4.0″ to keep you stay hydrated at all time, The water bottle is not included. 100% Money Back Guarantee – Buy running waist pack with confidence knowing that no matter what, we’ve got your back! Whether you need a replacement, or the fitness belt just isn’t working out,If you don’t like it, just send us an email and we will give you a full refund! AIHOLES Sports prioritizes on ensuring excellence in Quality, Eco-friendliness and utmost comfort with our fitness sport gear apparel, outdoor accessories & innovative Health devices. Designed for practicality while maintaining a stylish look. It is perfect for men, women and kids during all forms of exercises and outdoor activities. With an additional elastic band extender, Fits all waist sizes, versatile can be worn as a Waist Belt or a Shoulder Bag. Water-repellent and tear-resistant nylon material. Inner key pouch and key clasp to prevent keys from moving and scratching valuables. Water bottle holster contains an adjustable elastic loop that can be tightened over your water bottle to prevent bouncing and falling out. Expandable pocket versatile for life and sports. 12-month hassle-free warranty and lifetime support and we have passionate customer service representatives that are more than happy to help you with any questions or concerns, and will respond within 12 hours. Reminder: Only waist bag,other decoration accessories and Water Bottle are not included. *Please DO NOT modify our product or parts of it in any shape or form. *Please keep away from fire, or corrosive liquid. *Please keep away from kids under 6 years old. Love it or your money back. 100% guaranteed. If you don’t like it, just send us an email and we will give you a full refund.